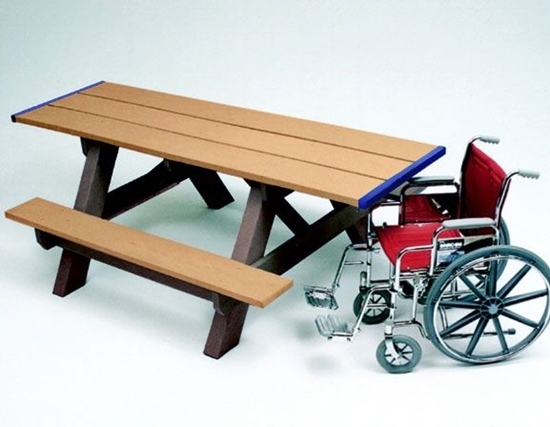 The ADA wheelchair accessible rectangular picnic table is 8 feet and made with commercial grade recycled plastic lumber. The 29 inch wide tabletop on these picnic tables, raised to a height of 32 inches high and extended to a length 96 inches long, allows a wheelchair to sit comfortably at either end of the table. Since it allows for a knee space of 30.5 high, 40.5 wide, and 19 deep, the table is in compliance with the Americans with Disabilities Act. The 72 inch long benches allow 6 people to be seated at the table. On the tabletop, blue end caps signify wheelchair accessibility. Assembly is easy, and stainless steel hardware is included.